I’ve been reading and writing a lot about power, looking at some of the big power theories out there. But many of our everyday theories of power are not buried in academic libraries, but right in front of us in gleaming spandex. I’m talking about superheroes. 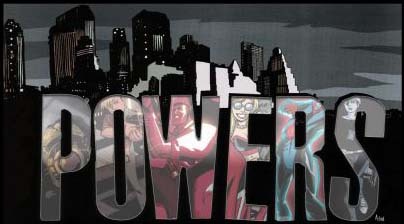 If superhero comics are all about power, what kind of power are they talking about? What are they teaching us? Read on, true believer! 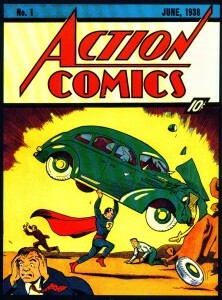 Since Superman’s first appearance in Action Comics, most superheroes have been defined by one or more powers: flight, invisibility, healing factor, vomiting, etc. In this sense, a power is an ability. This usage implies that we all have “powers,” though ours are decidedly less super. I, myself have the power to walk, to breathe, to protest, and to blog. In their typology of power, Lisa VeneKlasen and Valerie Miller would call this kind of power “Power To…the unique potential of every person to shape his or her life and world.” This use of the word power also assumes that power is something that an individual has and can use — though it can be taken away with some well-placed kryptonite. 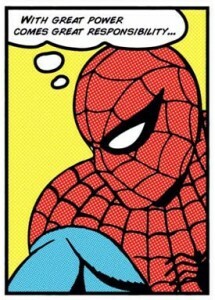 Perhaps the most famous line in comic book history came from Spiderman: “With great power comes…great responsibility!” Superheroes are those who take up this mantle of responsibility to others, while supervillains do not. This resonates with the ideas of Steven Lukes. Lukes says that one of the reasons we need to talk about power is because we need to figure out who we can hold responsible. He defines the “powerful” as those to whom we can attribute responsibility — either for acting, or for not acting. Just like Spiderman holds himself responsible for not stopping a thief, who later killed his uncle, we can hold powerful people like CEOs and politicians responsible for not protecting the environment (for example) even if they aren’t the ones doing the polluting. This is because they have the power (and thus the responsibility) to step in. 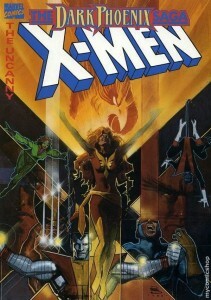 In one of my personal favorite comic book stories of all time, the Dark Phoenix Saga, the author (mis)quotes Lord Acton: “Power corrupts, and absolute power corrupts absolutely.” We see this corruption in action as Phoenix, who has the power to consume stars, turns into Dark Phoenix and does just that. In a more recent twist on this theme, the comic series Irredeemable shows how a superman-like character, with a bit of an inferiority complex, transforms into an unstoppable villain. Today the casualness with which we approach corruption in government shows that we pretty much take this idea as a given. The “balance of powers” in governments like the US is an attempts to avoid absolute power and thus absolute corruption (though this balance seems to be deteriorating). The X-men got their powers from genetic mutation, Superman from our yellow sun, and the Fantastic Four from “cosmic rays.” But Batman was just really, really rich (and a little crazy). This was enough to land him a spot among the worlds most powerful superheroes in the Justice League. While many comics celebrate purely individual power, there is also a strain of collective power running through the superhero world. 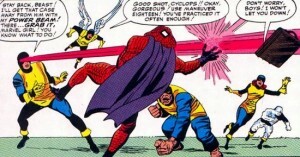 The X-men in particular continually learn that while each has a specific, individual power, its usually only by combining their powers that they can succeed. 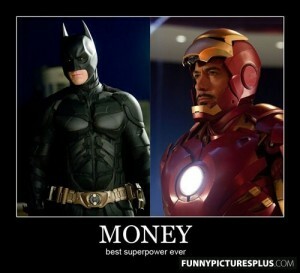 As the recent Avengers movie showed, even the most powerful must unite when the big threats come down. Combining our powers makes us more than the sum of our parts. The power of collective action is sometimes called “power with.” Bernard Loomer writes about a similar concept of “relational power,” which is the power that comes from true collaboration, from not only being able to change others but being open to change yourself. While there are many types of power at work in superhero comics, it is perhaps more notable which types of power are absent. There is little to no talk of the power of systems and institutions, or the power of cultural forces like mass media. What if power is not something a person can “have” at all, but something that surrounds all of us, shaping not only what we can do but what we even think is possible? I’ll be exploring some of these ideas in upcoming posts in this ongoing series.